Welcome to the Peckham Pet-Tastic website. This is the place to be if you like dogs dressed up, and who doesn't love a clothed canine? 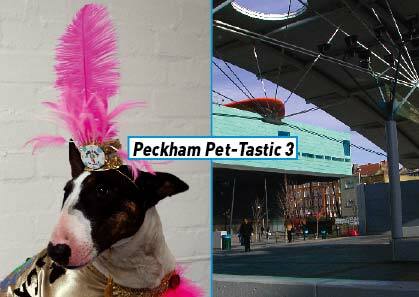 Peckham Pet-Tastic is a fancy dress picnic for dogs, which takes in Peckham Square, outside Will Alsop's award winning library. Dog owners are invited to make a costume, dress up their dogs, clip on their leads, and bring them along to this art social event. Peckham Pet-Tastic is a celebration of our creativity,our relationships with our pets, with each other and with Peckham. Take a wander around the site, have a look at the photographs, and let us know what you think. Peckham Pet-Tastic is the work of Rachael House, and is a Space Station Sixty-Five satellite event.